We are pleased to announce the launch of our self-guided tour of the historic riverfronts of downtown Lewiston and Auburn, easily accessed by anyone with a smartphone or tablet. The free TravelStorysGPS app is available through iTunes (for Apple devices), or from Google Play (for Androids). The walking tour guides people along the paths lining the river in both Auburn and Lewiston, and visits sections of the historic downtown mill area as well. The paddling tour, which will be launched this summer, covers much of the same downtown area, but from the vantage point of the river where people can explore rarely seen canal systems. 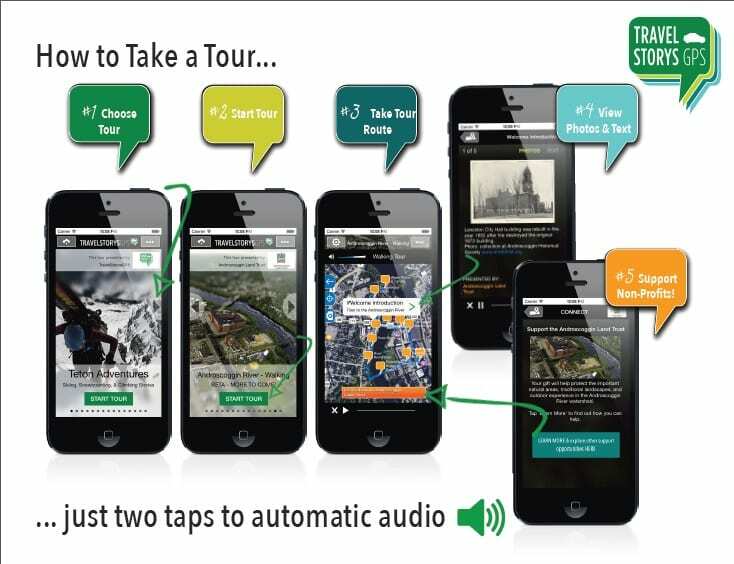 The app uses GPS technology to trigger audio stories when the device encounters one of the tour’s featured landmarks, but the tour can also be taken remotely by simply clicking on the individual tour sites. The tours offer historical images and descriptive information about how the lives of people in the area—beginning with the Native Americans—have been intricately tied to the Androscoggin River, and how this relationship has shaped the land, cities, and river over time. ALT’s impetus for creating the tour is to help local residents and visitors learn more about the history of the river and other local natural resources, which we hope will encourage informed and thoughtful decisions about their future use—weighing issues such as environmental sustainability, growth, and quality of life. Our hope is that the app will be a useful tool creating youth steward opportunities as school groups explore the riverfront. We also hope that the tours will enhance the experiences of new visitors to the Lewiston/Auburn area as well. This multi-sensory tour is a great way to learn about the rich history of the area and the remarkable recovery of the Androscoggin River in recent decades. Download the free app, and then bring your smartphone down to the river and check it out! ALT thanks the funders who made this project possible: The Elmina B. Sewall Foundation, Maine Community Foundation, Maine Outdoor Heritage Fund, and The Bates College-Harward Center’s James W. and Sally Larson Carignan Fund for Community Programs.